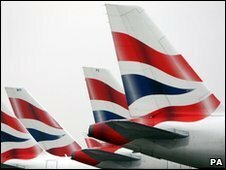 British Airways, American Airlines and Iberia have offered to give up slots at airports in London and New York, say regulators at the European Commission. The three Oneworld alliance members will be hoping this draws to a close the commission's inquiry into their co-operation on transatlantic routes. The commission has asked interested parties for comments by 10 April. Virgin Atlantic's Richard Branson has described the proposals as "woefully inadequate". The six pairs of take off and landing slots on offer are at London Heathrow or London Gatwick airports on routes to Boston, New York, Dallas and Miami. British Airways, American Airlines and Iberia have also said new entrants would be able to join the frequent-flyer programmes that they operate on the relevant routes. The European Commission argues these proposals will enable other airlines to start operating transatlantic routes by lowering the barriers to entry, and that the slots surrendered will compensate for the fact that the three airlines are no longer in competition. "There will still be a choice of flights so consumers are not harmed by this deal," said European Commission spokeswoman Amelia Torres. She explained that the slots on offer were equivalent to 42 flights a week between London and US cities. But Virgin Atlantic argued that British Airways and American Airlines would still control 100% of the international routes in and out of Dallas, 80% of those in Boston, 70% of those in Miami and 68% of those in Chicago. European Commission began investigating the level of co-operation between the three airlines in April 2009.